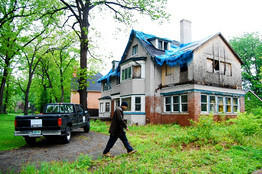 DETROIT—Wrecking crews are preparing to tear down a landmark 5,000-square-foot house in the posh neighborhood of Palmer Woods in the coming weeks, a sign that Detroit is finally getting serious about razing thousands of vacant and abandoned structures across the city. In leveling 1860 Balmoral Drive, the boyhood home of one-time presidential candidate and former Massachusetts Gov. Mitt Romney, Detroit is losing a small piece of its history. But the project is part of a demolition effort that is just now gaining momentum and could help define the city's future. Detroit is finally chipping away at a glut of abandoned homes that has been piling up for decades, and intends to take advantage of warm weather and new federal funding to demolish some 3,000 buildings by the end of September. Mitt Romney's boyhood home is among 3,000 derelict structures Detroit plans to demolish by the end of September as it attacks blight and crime. Mayor Dave Bing has pledged to knock down 10,000 structures in his first term as part of a nascent plan to "right-size" Detroit, or reconfigure the city to reflect its shrinking population. When it's all over, said Karla Henderson, director of the Detroit Building Department, "There's going to be a lot of empty space." Mr. Bing hasn't yet fully articulated his ultimate vision for what comes after demolition, but he has said entire areas will have to be rebuilt from the ground up. For now, his plan calls for the tracts to be converted to other uses, such as parks or farms. Even when the demolitions are complete, Detroit will still have a huge problem on its hands. The city has roughly 90,000 abandoned or vacant homes and residential lots, according to Data Driven Detroit, a nonprofit that tracks demographic data for the city. After a stuttering start, caused by a dispute over the disposal of asbestos from demolished homes, the program is just now gaining pace. City officials say they aren't sure how many structures ultimately need to be torn down. The mortgage crisis compounded Detroit's economic decline, leaving nearly 30% of the city's housing stock vacant, according to Data Driven Detroit. "Neighborhoods that are considered stable are now at 20% vacancy," said Deborah Younger, a development consultant involved in the demolition effort. Until recently, the city didn't have the funds to tackle its growing list of houses slated for demolition. But $20 million in federal funds, primarily stimulus dollars has helped to kick-start the effort. Demolition, particularly of historic buildings, is a sensitive issue in Detroit, often leading to wrenching battles between developers, residents, city officials and preservationists. But many residents are now pleading with the city to tear down decaying structures that are attracting crime and repelling home buyers. However, some still worry that the sort of large-scale bulldozing that the city is now talking about will forcibly dislocate longtime homeowners and preclude any chance of a comeback for Detroit. "The city has never done this before," says Ms. Henderson, the Building Department chief. "We had to make a culture change." The demolition of the Romney family home is the first of its kind in Palmer Woods, a high-end enclave in northwest Detroit that was developed at the dawn of the U.S. auto industry and housed many of its pioneers. Palmer Woods has just a handful of vacant properties among its 292 homes, according to residents. It's one of the anchor neighborhoods that is critical to the success of Mayor Bing's right-sizing effort. The house was owned by Mr. Romney's parents, George and Lenore Romney, from 1941 until 1953, when the family moved to the northern suburbs. The elder Mr. Romney would go on to become head of American Motors Corp., then governor of Michigan and U.S. secretary of Housing and Urban Development. As recently as 2002, the house sold for $645,000. But it has had a troubled history since then, lapsing into foreclosure more than once, bouncing between lenders and falling into disrepair. Last year, following years of complaints from neighbors, Wayne County declared it "a public nuisance and blight" and ordered it demolished. The younger Mr. Romney, who is considered a leading GOP presidential candidate for 2012, said "it's sad" that his childhood home is being razed, "but sadder still to consider what has happened to the city of Detroit, which has been left hollow by fleeing jobs and liberal social policies." Residents of Palmer Woods take pride in their tradition of historic preservation. But they're happy to see this house go. "This is an eyesore, and it makes no economic sense to fix it," said Joel Pitcoff, a retiree who lives around the block. "Who wants to spend $1 million on a house so it will be worth $400,000?"